These Contact Poi are made from Play 90mm and 100mm contact spheres, Aerotech rope, and handle options to match your particular spinning style. Thanks to their design, these heads are made without cutting the ball or any external hardware, leaving the heads in perfect visual and physical condition. The Poi heads are made from Play contact spheres. 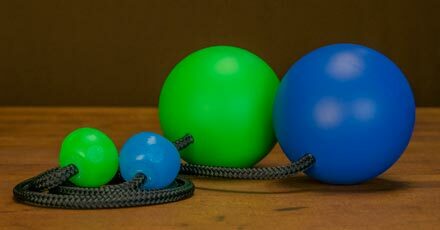 The brightly colored PVC spheres have a grippy texture, making them durable and well-suited for contact poi tech and regular poi spinning. The 90mm (3.55") option is generally preferred, weighing 180g (6.34oz). For people looking for larger, heavier solutions, we also offer 100mm (4") heads in both light (200g/7oz) and heavy (260g/9oz) options. The leashes are made from 1/4" Aerotech rope, a softer, smoother, more abrasion-resistant, and generally longer-lasting rope than MFP (the most commonly used rope for Contact Poi). And, unlike MFP, this rope won't shrink over time. PomGrips are the most-preferred Poi handle solution. They are made of silicone and available in a range of colors.